I knew I wanted to see this show from the second I heard about it; a tongue-in-cheek love letter to both Musical Theatre and Shakespeare, starring Brian d'Arcy James (who was fantastic as Shrek) and Christian Borle, both from a tv show I adore - "Smash". Plus getting to see an original broadway cast.... how could I not? Something Rotten! is the creation of brothers Karey & Wayne Kirkpatrick and John O'Farrell, with direction and choreography from Casey Nicholaw, who continuously proves why he's the popular choice on the musical theatre scene right now. From the moment Minstrel Michael James Scott opens the show, with his smooth, creamy voice, singing the intro to the irresistibly catchy "Welcome to the Renaissance", I knew I wasn't going to be disappointed - we leap straight into a big, feel-good ensemble number. Shortly after, we are introduced to brothers and struggling playwrights Nick and Nigel Bottom, played by Brian d'Arcy James and John Cariani, living in the shadow of Shakespeare. The brothers are at odds in their approach to their art - Nick hates Shakespeare and even has a song to say as much, Nigel on the other hand is a bit of a fan and wants to emulate him. Brian d'Arcy James is aggressively assertive yet endearingly determined as Nick, and Cariani is sweet, naive and nerdy as "fan-boy" Nigel. Then there's the show-stopping moment when Nick Bottom meets Soothsayer Nostradamus played by Brad Oscar who is absolutely hilarious. 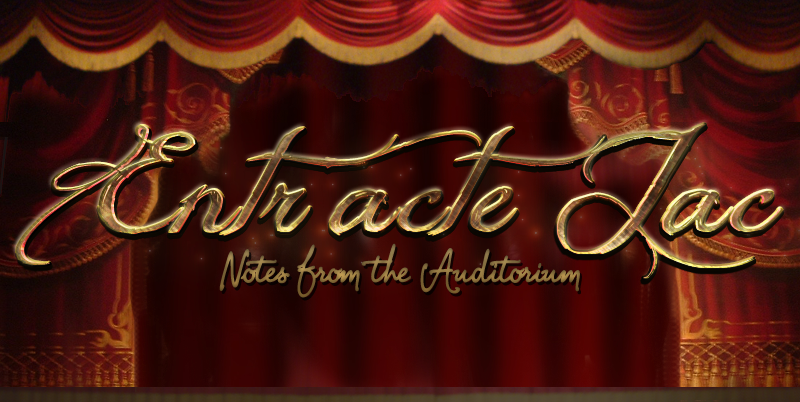 Nostradamus can see the future, though it's vague, hence mistaking "Hamlet" for "Omelette" ; his predictions for the future of theatre are presented in the song 'A Musical' which needs no explanation. The term "showstopper" isn't an unfamiliar concept to me, but this is the first time I've really seen a song properly stop the show for a few minutes. There's a bit of a build up to the arrival of Shakespeare, which created that rock-god tension that they were going for; I found him reminiscent of Stacee Jaxx from Rock of Ages. Christian Borle is fantastic, tapping into an arrogance and self-importance that just makes this role. There is something oddly alluring about Borle as Shakespeare, whether that's the attitude, the guy liner ..... or perhaps even those muscles he's been working on; I assume this is the reaction they are hoping for to the character - at the same time as being repulsed by his ego-mania, we need to identify with the God-like adoration for him. I was pretty impressed with his English accent which, although borrowed from the likes of Hugh Grant, is unwavering from start to finish. A Tony award well earned for Borle. Everything about this show is pure, unabashed musical theatre from the gorgeous, innovative costumes (a mixture of 16th Century and modern day), pantomime style glitzy sets, flashing lights, large ensemble numbers, high-kicks, tap-dancing, catchy ear-worm songs, which you'll find yourself humming as you leave the theatre - a sign of a good score - and lots of laughter, especially if you are a big musical theatre fan who'll pick up all the references. I loved every indulgent moment. I really think this show would appeal to a wide west end audience, so let's hope it makes it overseas - get nagging people. I actually was blissfully unaware when I booked this show that it was based on a cult film. I booked based on the amazing reviews, the fact it seemed off-beat and original, not to mention a stream of high profile theatre performers jumping at the chance to perform in that title role. I happened to be checking out the soundtrack and a (non theatrical) friend started singing along and told me it was one of her boyfriend's favourite films. Hedwig and the Angry Inch is a punk-rock musical written by original Hedwig, John Cameron Mitchell and music by Stephen Trask. It is a relatively short show in comparison to others on Broadway and doesn't have an intermission. This, combined with the grungy set gives the feeling of being in some run-down venue watching a rock-cabaret show. 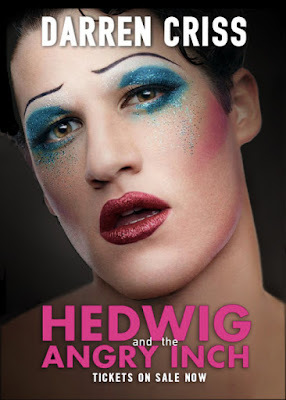 Over an hour and a half, Hedwig's story unfolds - it's initially bold, brash and down-right dirty (prepare for much debauchery and face-licking) but as the narrative progresses, a murkier, heartbreaking tale emerges, giving context to the character we are presented with. Darren Criss is surprising in this role, granted I had only seen him in the TV show "Glee" as a much different character - squeaky clean and privileged. Hedwig is the antithesis to this. Criss gets to show off a range and depth of his acting skills, from the big, loud and outrageous to small and vulnerable. More like a play with musical support, than a musical as such. There's a depth to this production, with many layers to uncover - in Hedwig's case, literally as well as figuratively - as the play progresses layers come off the not only the person but the persona as well, revealing the raw, damaged man beneath. In a way, the story belongs as much Hedwig's husband, backing-singer, roadie and sidekick "Yitzhak" (played by Rebecca Naomi Jones) - a female-to-male transgender, whose character is revealed without him even needing to speak many words; Repressed and pushed to the background, yet tirelessly, thanklessly running around after Hedwig, tidying up the messes she leaves behind. As Hedwig descends and re-emerges as Hansel, Yitzhak rises and emerges as a female, stepping into the vacant spotlight usually occupied by Hedwig. There is so much else I could say about this show and I feel like this is scratching the surface. It's so different to any of the musicals out there right now and I'm excited to hear, through the rumour mill, it may be coming to the West End soon. This could be just the tonic our theatre scene has been thirsting for. Writing this review, I often found myself confused as to which pronoun to use - him or her? Gender is such a complicated issue in this show as both characters identify as both male and female during those intense 90 minutes. I decided to use the pronoun relating to the gender they identified with for most of the show. 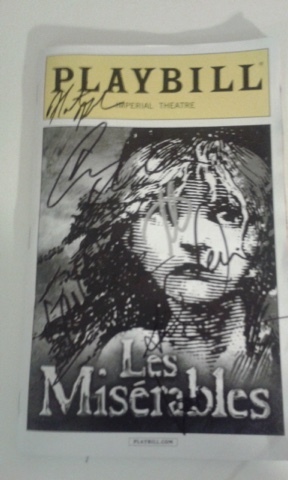 How could I not visit Les Miserables during my New York trip? As well as being a lifelong favourite (alongside Phantom), I'd heard on the grapevine that Broadway's version is quite different and I couldn't ignore that, I had to see this reimagining for myself. I was particularly excited to see how they handled Javert's suicide considering that is the most infuriating part of the London version - the mood-killing, ever-hilarious, post-death rotate and roll offstage. Yes, I can see you rolling off stage up there - how am I suppose to connect to my emotional response to that characters demise when I can see the actor rolling offstage? In the Broadway version, this isn't an issue thanks to the fact there is no revolve. Instead, they use a mixture of flies and projection to give the illusion of Javert falling to the water below the bridge; a much more dramatic, impactful image to end on. However, I'm not condemning the revolve entirely; without it, the students death scene upon the barricade had much less impact. The visual impression of that revolving barricade cluttered with lifeless bodies holds more emotional weight than the static barricade. The barricade generally wasn't a feature like it is in London, being used only in the one scene it was needed. I can't decide yet whether this is for the better or worse - I think, perhaps, neither better nor worse, just different. London's sets are subtler, relying on imagination and implication, Broadway hands the scenes to you more literally - there are frequent, detailed scene changes. I loved the scenery for "Look Down" - a facade of apartment blocks complete with windows and balconies where the ensemble sing from. I found it quite a treat to watch former West End Phantoms Ramin Karimloo and Earl Carpenter perform together as Jean Valjean and Javert respectively. I thought their energies gelled well together but felt neither connected as well to their characters as they had to the phantom. The standout performance for me was Gavin Lee as Thenardier. I was completely captivated by him when he was onstage and he seemed to tap into an element of the character I hadn't felt from any previous incarnations - he merged the humour with the darkness and immorality to exactly the right degree. I also thought Brennyn Lark did a great job with one of my favourite characters, Eponine, she seemed to really understand the situation and emotions of the character, her reactions always spot on. I was surprised to see this is her Broadway debut, I think she'll do well. 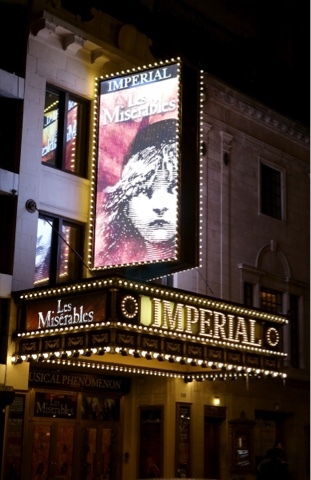 So, which do I prefer - Les Miz Broadway or Les Miz London? That's the interesting question here, ultimately, isn't it? It's something I've been pondering but I've come to the conclusion that perhaps it's best not to compare and just take them as they are - different interpretations of the same show. There are some things that are more effective in Broadway and some that are more effective in West End, but would I want a mix and match for the "perfect" performance?.... No. Les Miz London could benefit from a little freshening up, but, in the end, I think the two incarnations work best as individual and unique tellings of the same well-loved story. I've always been a little resistant of immersive theatre - I've seen enough uninspired attempts that put me off entirely for a long time. That began to change last year after I saw "Generation of Z" at the Edinburgh Fringe and saw what this form of theatre could be. I'd heard of the company Punchdrunk (it was hard not to) from enthusiastic tweets for their production " The Drowned Man". Though my interest was piqued, I still felt a certain reluctance toward this kind of theatre and never actually made it before it closed. A fact I now regret. I wouldn't want to tell too much about what waits for you at the McKittrick Hotel, as part of the pleasure is in the discovery, so instead I want to give an essence of what it feels like to experience "Sleep No More". participant. That being said, you are encouraged to rifle through drawers, cupboards and anything else to which you have access. As you leave the elevator, it's completely up to you - your "choose your own adventure" begins. I won't say much more about what happens after this point, except a couple of points. The storyline is loosely based around Macbeth with elements of Daphne Du Maurier's Rebecca mixed in. It's got the essence of a wordless 1930s film noir, the story is told through physicality and dance. The atmosphere feels nightmarish at times; chasing shady characters through dimly lit corridors to the beat of haunting soundscapes, surrounded by masked figures all linked in anonymity. And please, please people, go it alone. You'll get so much more out of it, and if you are there with friends, you'll all have different experiences to discuss when you meet up again at the end. 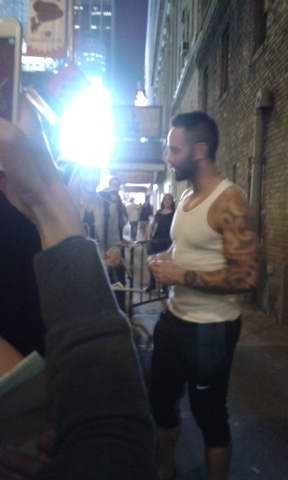 I checked out of the McKittrick hotel that evening completely bewildered but equally intoxicated by the experience. I can't claim to understand what was going on after just one visit, but part of its beauty lies in the mystery. I understand now why many people return time and again, with so many character paths to follow, so many doors to open, I'm not sure the mystery at McKittrick hotel can ever be fully unlocked but the joy is in the journey and I certainly hope to be able to go again.